Scott Fly Rod Company out of Montrose, Colorado has been building rods since 1974. Their completely American built hand-made rods have caught the attention of the fishing industry once again with some of their new rods. The Radian, a fast-action rod that keeps the feel of the “Scott Difference” and is one of the top all around rods on the market. Their other new model, the Tidal, is a saltwater rod priced at a very reasonable price point. It again is a “do-it-all rod” that is perfect for fishing the bay or to take on a trip to the flats. We also have their beloved F2 series as well as G2 series in stock. Come in and feel the “Scott Difference” today. This entry was posted in gear on July 21, 2015 by Josh Reider. We fished yesterday and were able to catch a sulphur hatch on the Little Gunpowder River. The fish went crazy, they were rising so much that you never knew where the next one would rise. After the hatch, the fishing became slow until in the evening we landed a couple brown trout on an Elk Haired Caddis. Thanks for your help with the fly selection, they worked! This entry was posted in fishing report on July 17, 2015 by Josh Reider. If you are tired of fishing for finicky trout try fishing the warm-water options all around the area. Fishing for bass on top-water flies, like the poppers tied by Eric Snyder below, can be a lot of fun. Carp are another great warm water target species. To catch a carp you must be able to make accurate casts, choose the right fly, and have a little bit of luck. They are very difficult to catch, especially when they are feeding in shallow water. Stop by the shop to check out some of Eric’s patterns and give the warmer water a try before summer ends. This entry was posted in fishing report on July 14, 2015 by Josh Reider. How many times when fishing have wished you could have a tippet size between 5X and 6X? Look no further, Trout Hunter has tippet sizes in 0.5X. Our personal favorites for the Gunpowder are 5.5X and 6.5X. They come in a UV resistant package to keep the nylon from breaking down. All tippet spools have color-coded bands rather then small numbers to distinguish between tippet sizes. Another great advantage is having a 50 yard spool rather then a 30 yard spool, which means running out of tippet less and spending more time on the water. Trout Hunter leaders also come in a standard UV resistant package. 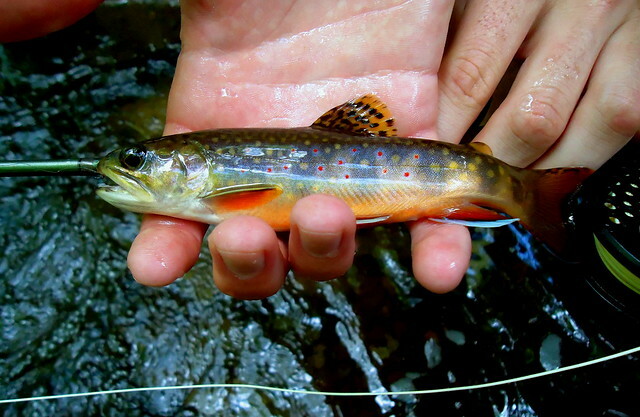 Whether you need a 14 foot leader for stalking spooking fish in the chalk streams of Pennsylvania, a 8 foot leader to fish little brook trout streams in western Maryland, or a 9 foot leader for fishing in a drift boat out west, Trout Hunter makes a leader for it. Our favorite leader for fishing on the Gunpowder is a 12 foot Finesse leader designed to fish small dries. Come in and try out the products designed by René Harrop that Trout Hunter offers. This entry was posted in gear on July 12, 2015 by Josh Reider. With the Gunpowder River at 92 CFS and peaking at 52°F at Falls Road, fishing the last couples days has been great. We have seen fish looking up and willing to take a variety of patterns. Fishing small caddis in a tan or dark brown has been the most productive method but many have started to fish small ants and beetle patterns on the river. Many fish have been holding on the banks of the river, so be sure to make a cast or two before you get into the water. You will be surprised where some of the little browns will hold. If fish are not rising many have had success nymphing small caddis pupa and zebra midges. The fish above fell for a little beetle pattern fished along the bank. As long as the weather holds true, fishing should be great this upcoming weekend. Swing in the shop on your way to the river and pick up a couple small terrestrials like the hoppers below tied by Rainy’s Flies. This entry was posted in fishing report on July 10, 2015 by Josh Reider. Please join us for a fly fishing school. On Sunday, July 12th, a Backwater Angler Guide will be teaching a fly fishing school that is ideal for beginners. If you’re planning on fly fishing in Maryland, or anywhere else for that matter, this course is a great introduction to the sport. The school covers knots, casting, gear and fly selection. Class is held from 9:00 AM till 12:00 PM. Cost is $125 per person and includes the use of gear. A Maryland non-tidal fishing license and trout stamp is required and may be purchased at the shop with check or cash the day of the school. Class size is limited to 4 and pre-registration is required. Please give us a call at 410-357-9557 to pre-register. This entry was posted in events on July 9, 2015 by Josh Reider. Come in and check out Winston LT and WT rods we have in stock. We have 4 LT’s in 9′ 6 weight, 8’9″ 5 weight, 7’9″ 3 weight, and 7’9″ 2 weight models. We also have 3 WT’s in 8′ 4 weight, 8′ 4 weight TMF, and 7′ 3 weight models. The softer tip of the LT allows for ease in close casts, while the lower sections provide enough power to fish larger flies at a distance. The WT series has a faster action giving enough backbone to make longer casts, but keeps the same “Winston feel” with a forgiving and softer tip section. Both models come with a nickel silver and burled wood insert for the reel seat. Come cast one of the rods at the shop and feel the difference in a Winston. This entry was posted in gear on July 8, 2015 by Josh Reider. The Gunpowder River is flowing at 104 CFS at Falls Road, a higher flow then we are used to seeing in the dead of summer. The frequent thunderstorms have added enough water into Prettyboy Reservoir to keep the flows high. Fishing terrestrials in the sections below Falls Road has started to prove productive and will only heat up as we continue through the remainder of the summer. Caddis have also been hatching throughout the middle of the day into the evening, a simple X-Caddis or Elk-haired Caddis in a size 16 should do the trick. Nymphing small Pheasant-Tails and Zebra Midges have been the best way to fool fish in the morning before the water heats up. The fish above was tricked on a caddis in the upper river. The fish pictured below was caught by Stephen Knott on a streamer right before a thunderstorm, a great fish to see on the Gunpowder. This entry was posted in fishing report on July 6, 2015 by Josh Reider. The Gunpowder River is flowing at 104 Cfs is 52f and clear until little falls. While the shop will be closed on the 4th, it will be open this Friday and Sunday. The 4th is the last free fishing day in Maryland this year so be sure to take advantage of it. With cooler weather ahead, plan on a BWO’s.The Sulphurs and caddis are a still a good bet try them in the #16-18 range. We’re also seeing a few ants and beetles making their way into the stream. Long leaders are still the trick. Typically as the water drops mid-summer a 10 foot leader in 6x is a good starting point-add some 7x and you’ll be in the game. Think short cast, long drift and you’ll be on the right track. This shot of a native Brookie Josh Reider released just across the border was too pretty to leave archived as it would give even the best fireworks display a run for the money. Have a safe 4th! This entry was posted in news on July 3, 2015 by Theaux Le Gardeur.